In honor of Earth Day and Earth Week, ZEAL Optics will plant a tree for every pair of its sunglasses sold during the week of April 22-26. The trees will be planted in the company's "5480 Forest," a project launched in June 2013 in partnership with American Forests. ZEAL's goal is to plant 5,480 trees each year as part of its Grounded Initiative. 5480 is also the elevation of ZEAL's Headquarters. The 5480 Forest idea came about after seeing the devastation that pine beetles have wrought across ZEAL’s home state of Colorado. Over the last decade-plus, the beetles, which were historically dormant in the winter months due to cold temperatures, have remained active year-round and are decimating the Rocky Mountains’ lodgepole pine forests, completely altering the range’s ecosystem and exposing the area to severe fire risk due to the massive expanses of standing dead trees. The beetles are estimated to have killed more than 70% of Colorado’s 1.5 million acres of lodgepole forests and are expected to finish their work, leaving an area the size of Rhode Island barren in their wake. ZEAL harvests and repurposes the dead trees to mitigate fire risk by using beetle kill wood in its packaging, optics fixtures, and office space and decided to take things to the next level with Project 5480 and this year’s Earth Day campaign. “All of our sunglasses are literally grown from plants, and we’re excited to continue to close that loop by planting saplings from those seeds of change,” said ZEAL President John Sanchez. 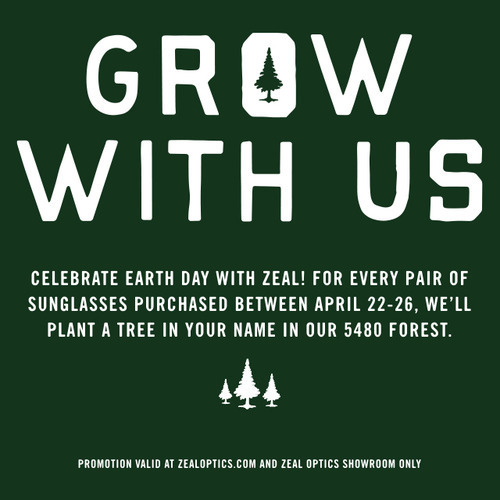 Purchase sunglasses on zealoptics.com or at the ZEAL showroom at 1230 Spruce St. in Boulder, Colorado and ZEAL will plant a tree in your name in Colorado’s 5480 Forest.